After 2 nights in New York, we boarded a train and headed to Boston. Our short 4th of July trip would have us spending 3 nights in Boston before flying back home to Los Angeles. New York was an added bonus to our trip, the real reason we took this vacation at all was to spend time in Boston over the 4th of July. We wanted to see the Boston Pops perform during their famous fireworks spectacular, and of course, watch the fireworks show itself. With that in mind, we booked ourselves into a room at the Liberty Hotel, one of the closest hotels to the Hatch Memorial Shell where the Boston Pops would be performing and the Esplanade waterfront area of the Charles River where the fireworks are set off from a barge in the middle of the river. The Liberty Hotel is famous because it used to be the Charles Street Jail in Boston’s Beacon Hill. After the jail was closed in the 1990s it fell into decay and disrepair. Instead of tearing down the hotel, plans were made to gut the jail and covert it into a luxury hotel. And the results are magnificent. When you enter the hotel you can still feel the echoes of the jail it used to be, but yet you immediately are greeted by the beauty of the stunning hotel it is today. In keeping with the jail theme and history of the hotel, many of the different facilities at the hotel are jail themed, with names such as the Catwalk, Alibi and The Yard. That includes one of the hotel’s restaurants, The Clink. 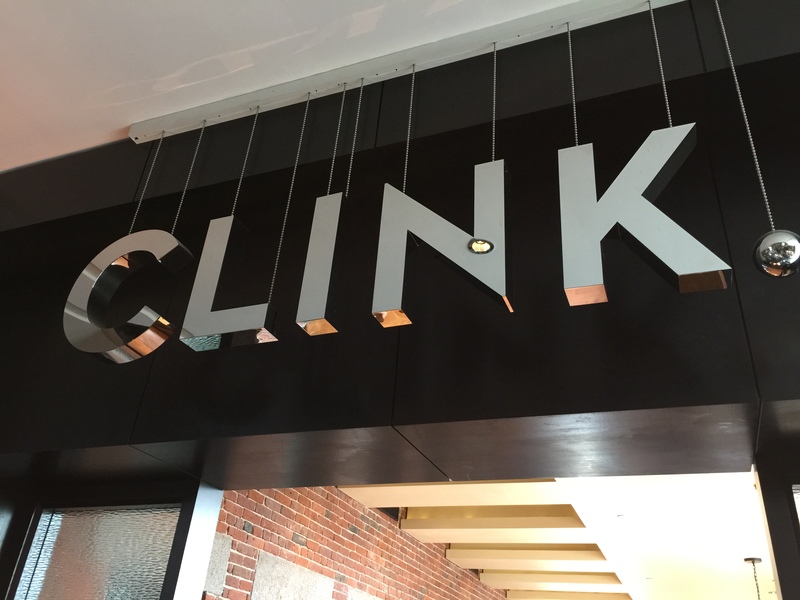 Located on the lobby level, the Clink serves modern American cuisine for breakfast, lunch and dinner. 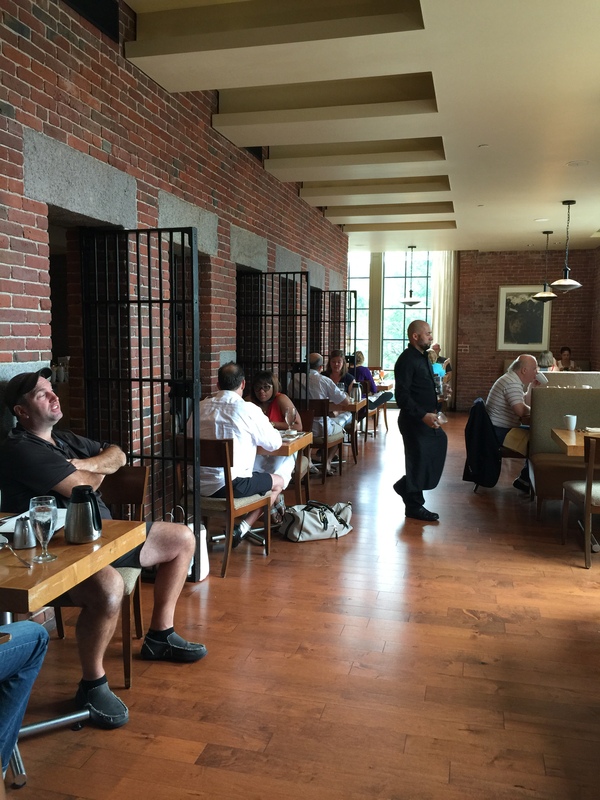 When you step inside the restaurant, it uses some of the hotel’s architecture and jail theme to recreate eating in a jailhouse setting with barred windows and brick walls. The restaurant itself was actually quite large and bright inside, much more than the entrance would indicate. On this 4th of July, we decided to take advantage of the Clink’s weekend brunch to have a nice leisurely brunch meal for the holiday. One of the Clink’s most famous weekend offerings is their Bloody Mary bar, which is set up just outside of the restaurants front entrance. 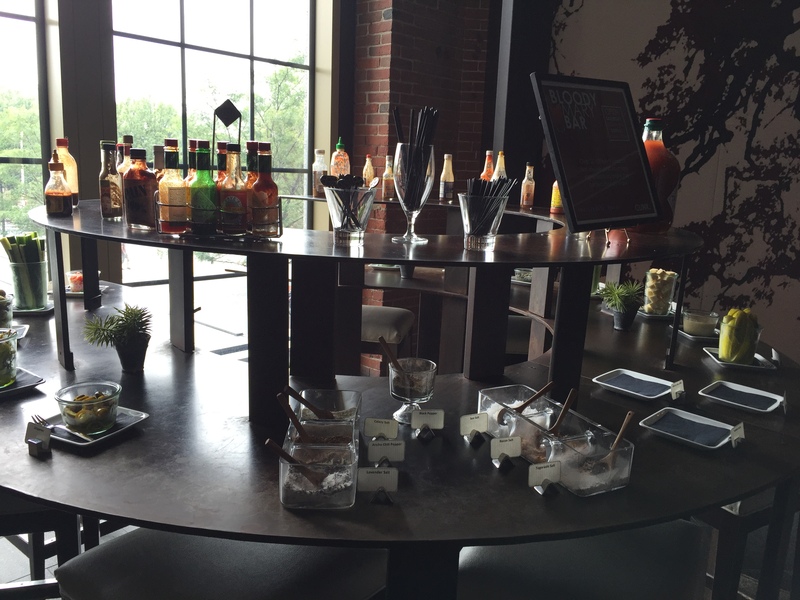 As the name indicates, it’s a make-it-your-own Bloody Mary bar with up to 30 different kinds of hot sauces, additives and salts so you can customize your morning Bloody Mary any way you want it. You start with a Bloody Mary, for which you can upgrade to premium vodkas like Belvedere, Ketel One or Grey Goose, and then the rest is up to you to customize the way you want. 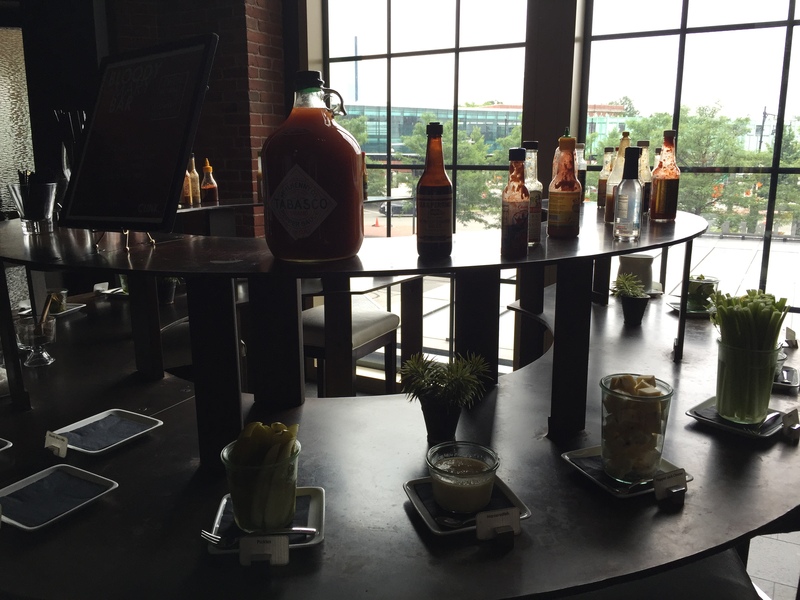 We saw quite a few people take advantage of this Bloody Mary bar. Quite cool. Too bad we don’t do Bloody Mary’s. 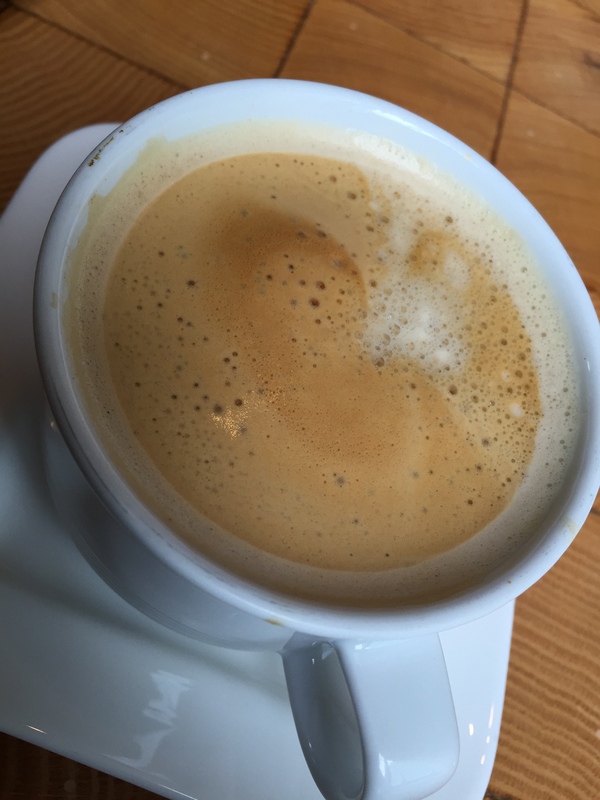 My husband and I started our mornings much the way we do every time we dine out for breakfast or brunch. A cup of orange juice for my husband, a cafe latte for me. I like orange juice, but I need the coffee in the mornings. 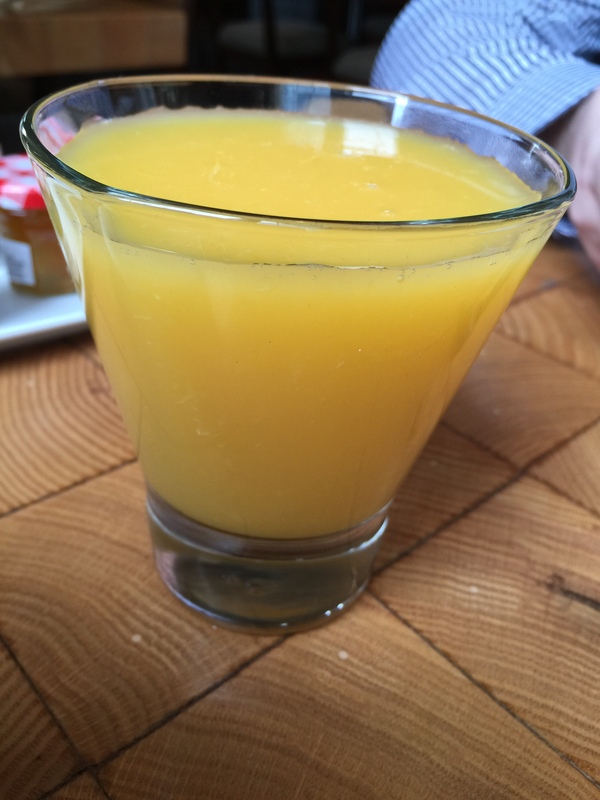 My husband is obsessed with orange juice and can’t resist ordering it whenever it’s offered on the menu. Morning drinks in hand, it was time for some breakfast. For breakfast, my husband ordered his favorite eggs Benedict. Made with english muffin, poached eggs and smoked ham all smothered in Hollandaise sauce, and served with a side of fresh fruit, this is my husband’s favorite breakfast offering. 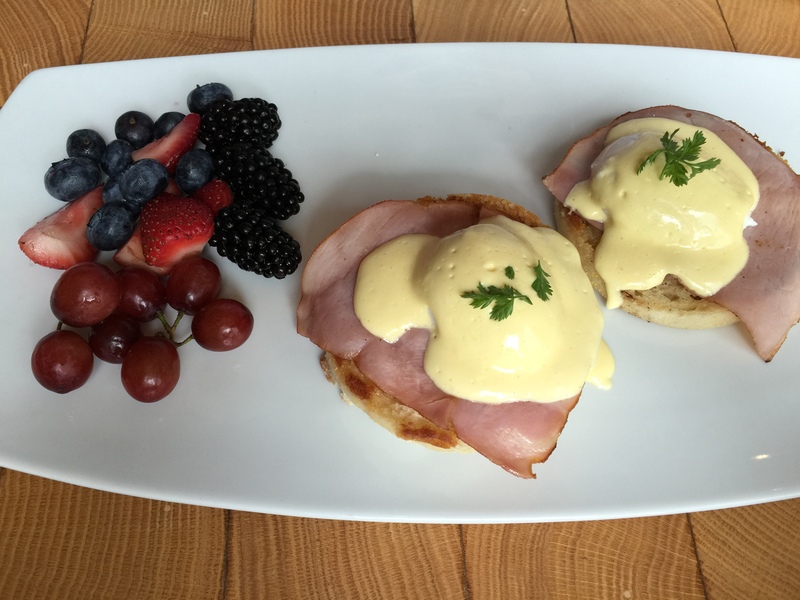 As my husband isn’t always the biggest fan of sauce of any sort, he liked that the eggs Benedict weren’t completely covered in Hollandaise sauce all over, but rather, there was just enough sauce for each English muffin. The sauce was good and a little citrusy, which my husband liked. Otherwise, there wasn’t anything particularly earth shattering about this eggs Benedict other than just being a good hearty breakfast meal. To go along with the eggs Benedict, my husband also decided to order a side of buttermilk pancakes. 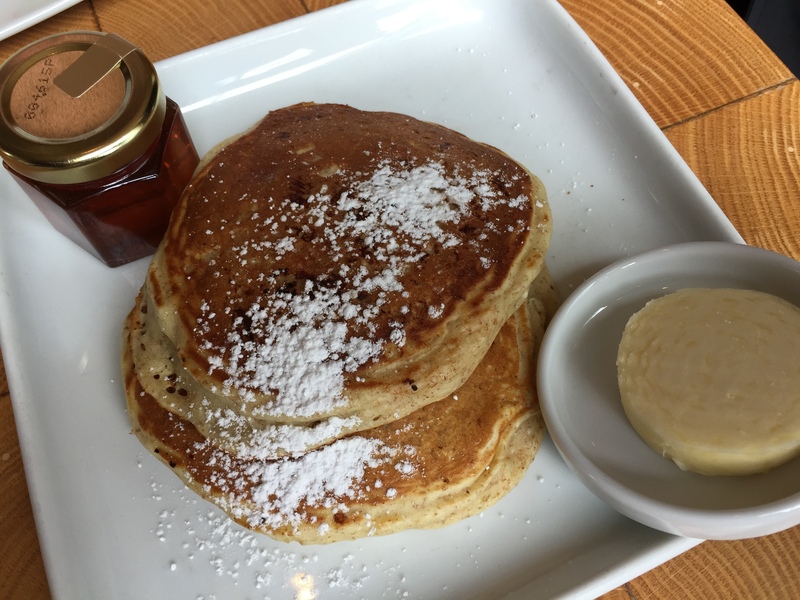 Three buttermilk pancakes dusted with a bit of powdered sugar and served with a side of butter and some Vermont maple syrup was the perfect side dish to my husband’s eggs Benedict. My husband liked the fluffiness of the pancakes and said that these were the best buttermilk pancakes he’d ever had. The pancakes were cooked perfectly and he could really tell that they were made using a buttermilk batter. I chose brioche French toast for my breakfast. Served with a peach & lavender sauce along with whipped cream and Vermont maple syrup, I added a side of smoked bacon. I was quite curious how the peach and lavender was going to taste as it seemed a different combination. I was quite surprised by how much I enjoyed the peach and lavender flavor combination as the peach added the hint of sweetness and the fruit flavor and the lavender was very aromatic in both flavor and taste. 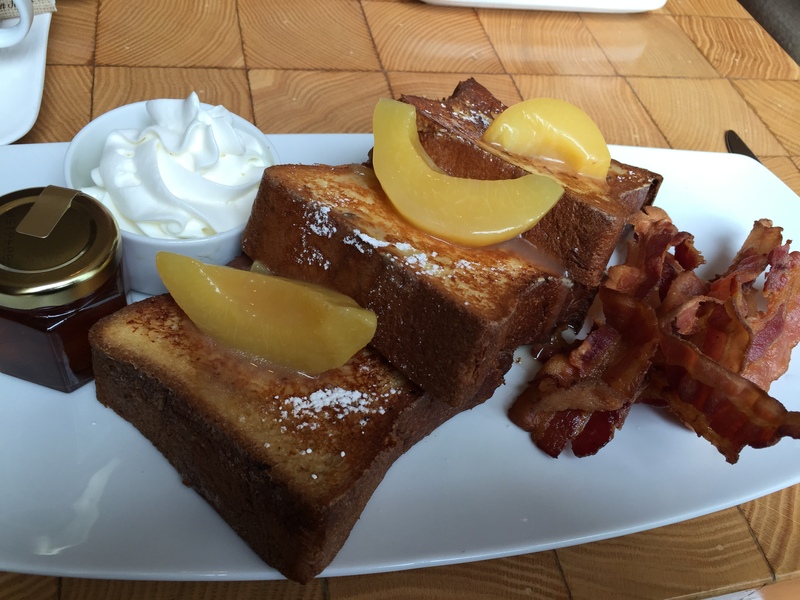 There was a floral essence to the overall sauce that was poured over the French toast. The three brioche slices you get on the plate are enormous and a bit overwhelming. And with slices of bread that big, the dish was very filling. I liked that the maple syrup and the whipped cream were served as sides so you could decide how much you wanted or not. As the French toast was already sweet from the peach and lavender sauce, I didn’t really need much of the maple syrup at all. I only added a little bit just to get a little more sweetness and to add to a contrast in flavors of sauce. This French toast was so filling I definitely didn’t need to each again until dinner time. 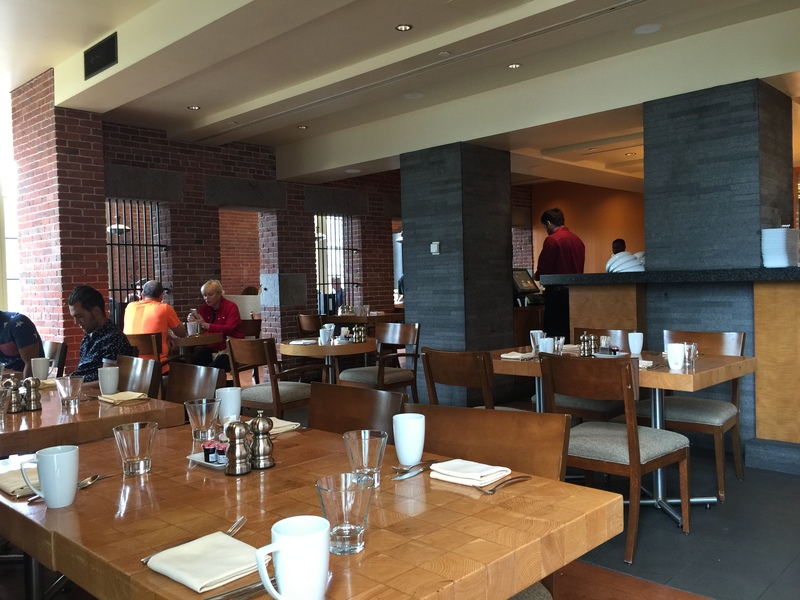 Enjoying a nice leisurely breakfast on the 4th of July at The Clink was relaxing and filling. So convenient that the restaurant was located in the hotel we were staying at so we didn’t have to go far. The food selection was wide and varied, the Bloody Mary bar a very novel idea, and the meals themselves delicious and filling. This was a good start to a day that would have us visiting the John F. Kennedy Presidential Library during the day and ending it by enjoying Boston’s spectacular 4th of July fireworks spectacular.